Today we are excited to announce that Exercise Timer just passed a massive one Million Downloads on Google Play. This is a monumental milestone for us and we can’t thank you enough for downloading the App. We couldn’t have reached 1 Million without you! One million downloads are equivalent to 2 downloads every minute for a whole year. One million people can fill ten of the world’s largest stadiums. It warms our hearts to think that all of you guys decided to join the Exercise Timer family. Exercise Timer was created about 4 years ago. At the time I was doing interval training at home and couldn’t find a good interval timer to do my workouts. So I decided to develop Exercise Timer for personal use. This quickly changed when I saw its potential. Today Exercise Timer helps people perform a total of 43,000 hours of workouts a month! To celebrate this amazing milestone we are doing a giveaway. 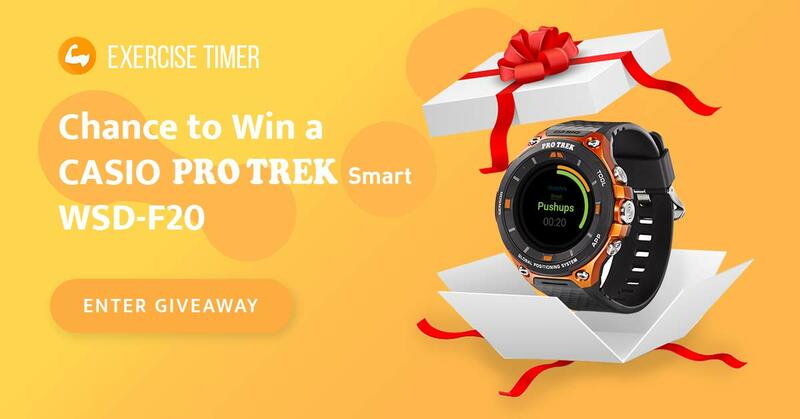 CASIO is giving one lucky winner a brand new CASIO Pro Trek smart. Throughout last year we have been working with CASIO to optimise Exercise Timer for the Pro Trek smart and give you the best workout experience possible. We are absolutely sure that this smartwatch would be a great tool for all your workouts. You can enter the giveaway using the link below. After entering the sweepstake, you can further increase your chances of winning by sharing your unique url. Every friend that you refer increases your winning chances by 10x!